The Sarasota County Commission has reappointed three members to its Public Facilities Financing Advisory Board, but county staff is continuing to see applicants for two vacant seats. 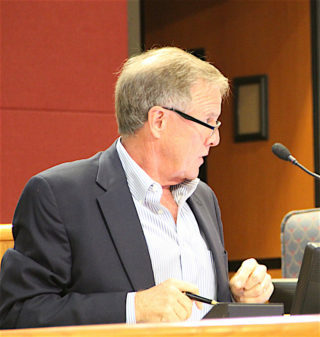 By unanimous vote on its Jan. 29 Consent Agenda of routine business items, the commission gave new terms on the advisory board to former County Administrator Jim Ley; Robert Bessom, who retired in 2008 after a decades-long career with General Electric; and Victoria Brill, who works in legislative affairs at the Florida Legislature. Bessom’s and Brill’s terms on the Public Facilities Financing Advisory Board (PFFAB) were up in January, while Ley’s term was set to expire this month. The terms are for three years. The PFFAB makes recommendations to the County Commission on impact fees, other funding sources and fiscal impacts of levels of service. The county webpage for the Public Facilities Financing Advisory Board points out that three members must represent public facilities and/or financial professionals; three must represent civic organizations; and three must represent development, building and construction. For the board’s most recent meeting — on Jan. 24 — the agenda included a discussion of the county’s impact fee report for the 2018 fiscal year, as well as the election of officers for 2019 and a discussion of the board vacancies. A staff memo in the Jan. 29 County Commission meeting packet explained that Ley and Bessom would continue serving as representatives in the Financial Professional category, while Brill would remain in the Civic category. The term of Jessica Bellman, a representative on the PFFAB in the Building & Construction Industry category, also expired, the memo noted. However, the memo indicated that she had not sought reappointment. The board’s attendance records for the past two years — which were included in the commission’s Jan. 29 agenda packet — showed Bellman attended all the meetings in 2017 but none of them in 2018. Her LinkedIn account says she became director of business development for healthcare architecture at HDR in the Tampa/St. Petersburg area in February 2018. Prior to that, she was director of strategic development at DeAngelis Diamond Construction. Ley had a 100% attendance record in 2018; 75% in 2017, the attendance records note. Bessom was present for all the meetings in both years, the records show. In his application for reappointment to the PFFAB, Ley wrote that he is a business development consultant with Alert Auto Insurance in Sarasota. He also serves on the county’s Health Facilities Authority and Industrial Revenue Bond Citizen’s Advisory Committee. Ley noted in his application that he served as county administrator for 14 years. Bessom, a Venice resident, pointed out in the resume he attached to his application that he “held numerous management positions, received numerous awards and authored many technical publications” during his 42 years with GE. He worked in the company’s Commercial & Military Engines, Engine Services, Strategic Planning, Marketing, Production, Finance, Information Technology, Business Practices/Processes, and Legal-International Trade Compliance divisions, he added. She added that she is a member of the Junior League of Sarasota, Sarasota Tiger Bay and Sarasota Young Professionals. The Jan. 29 staff memo said advertising would continue for qualified representatives for the two PFFAB seats that remain open. One of those is in the Civic category; the other, in the Building & Construction Industry category, the advisory board’s webpage says.